The Eight Three Eight Agency has been providing SEO & Targeted Search Services for over 10 years. We work with clients from Small Businesses to Global Corporations and high profile individuals including some Grammy winning Artists. From search engine optimization targeted for B2B relationships, lead generation and e-commerce optimization The Eight Three Eight Agency is a full scale agency ready to assist your business in becoming an industry leader. Our team of experts are experienced in all areas from research, market analysis, copywriting, web design, and web development to geo-targeted marketing and campaign management. National SEO Campaigns – A national scope requires extensive keyword research and careful planning. Our SEO analysts will spend a great deal of time with you in the discovery phase to gain as much knowledge as possible about your company’s value proposition, products, services, customers and competitors. Our meticulous approach gives us (and you) an edge by providing the insight to target keywords that present the best possible opportunities for lead generation. Global Enterprise SEO Campaigns – Our team has assisted National and global organizations with in-house SEO consulting that often tap into our expertise for temporary or ongoing support in areas where they are understaffed or lack experience. Areas where we assist include keyword research, competitive research, link profile analysis, domain transfers and content strategy. Local SEO Campaigns – Mobile search and targeted local SEO has become a near necessity for any company serving a local market. National companies also use local campaigns to improve organic search engine visibility in target markets, whether to increase market share, fend off competitors or introduce new products and services. Popular search terms such as “near me” and “local companies” have become popular search terms for local consumers looking for businesses in their area. 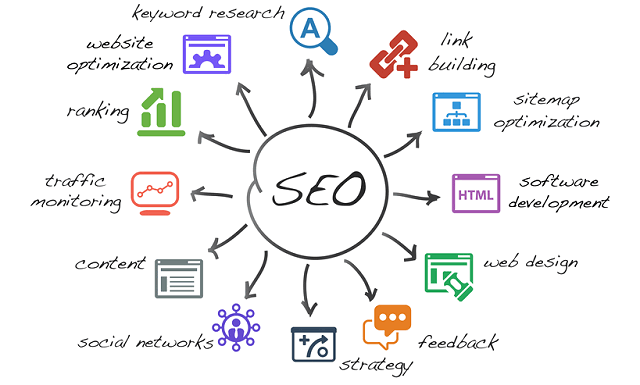 SEO is an acronym for “search engine optimization” which is the enhancement of web pages and their online profile so as to improve your site’s ranking in the Search Engine results pages (SERPS) for groups of keyword phrases. Click here to read more from Google about why SEO is important. Search engines have two major functions: crawling and building an index, and providing search users with a ranked list of the websites they’ve determined are the most relevant. Search engines are constantly changing how they rank webpages. The 4 main elements of positive search results depend on Keywords, Website Architecture, Creating Original & Engaging Content and a profile of beneficial internal & external links and proper link building. SERP is an acronym that stands for “search engine results page.” Essentially this means any list of Google (or Bing) results that displays a list of websites and relevant search results. The Sitemap or Sitemap.XML file is an index of all the pages on your site. The purpose of this file is to be used as a reference for search engines of content that you want indexed. A common misconception is that the XML sitemap helps get your pages indexed. The first thing we’ve got to get straight is this: Google does not index your pages just because you asked nicely. Google indexes pages because (a) they found them and crawled them, and (b) they consider them good enough quality to be worth indexing. Pointing Google at a page and asking them to index it doesn’t really factor into it. It is important to note that by submitting an XML sitemap to Google Search Console, you’re giving Google a clue that you consider the pages in the XML sitemap to be good-quality search landing pages, worthy of indexation. How often should I do SEO? SEO is not recommended to be a short term solution. Typically SEO is done for the life of the site to stay competitive in a clients designated industry. With so many changing parts, such as link degradation, evolving search engine algorithms, outdated content, and competition from other companies in your industry, SEO requires an ongoing commitment. Despite that, SEO offers a better ROI than most traditional marketing. Yes, social media has become an integral part of SEO. Websites that create high quality shareable content tend to receive more shares and tweets on Social media sites, which leads to backlinks that are more natural. Search engines see this as a sign of quality content and pay close attention to the volume of these social signals. How much does SEO/Search Engine Optimization Cost? There also may be a number of other factors into consideration as well such as previous SEO done to your website. There are times when other SEO companies have made it an easy transition to come in and start working. We’ve also encountered SEO companies that have previously done more damage to the client than benefiting the client and this process can take awhile to overcome and replace with a positive impact. Every client is different and every project is truly unique. Think about this analogy: a billboard in Times Square Manhattan vs a park bench add in Charlotte, NC. One of them might cost you hundreds of thousands of dollars, the other one will probably cost a few hundred dollars. The difference is both the location of the ad and the demographic exposure. One of the unique factors is that at the Eight Three Eight Agency we do not believe in traditional contracts that can generally leave a customer locked into an agreement even if the results aren’t beneficial. We believe in an old school mentality based on transparency and building trust between our company and our clients. All SEO projects are done on a month to month basis, where once a month we meet with each of our clients to discuss the results and how things are functioning. We believe in educating business owners on how traffic is driven to their site and the functionality that it takes to have a leading online presence.